Human Rights Activists News Agency (HRANA) – An intense wave of human rights violations has seriously undermined the Iranian Baha’i community over the past two weeks. For years, the Supreme Council of the Cultural Revolution has kept a firm hand on the upward mobility of Baha’i citizens by barring them from government employment and placing myriad obstacles on their paths to higher education. A toll of some of the campaign’s most recent victims underlines its widening scope: fifty-eight Baha’i students, after successfully passed this year’s National University Entrance Exam, stopped short of enrolling; at least four Baha’i students, at different stages university of study, expelled; ten Baha’i citizens, for unclear reasons, arrested by security forces; five Baha’i citizens sentenced to 5 years’ imprisonment; Baha’i-owned businesses forcibly sealed and kept out of commission by security forces and agents of the Bureau of Public Places. As in previous years, a large number of Baha’i students who participated in the 2018 National University Entrance Exam, known as “Konkur,” have had their applications flagged “deficiency on file” on the National Organization for Educational Testing website. According to an informed source, the “deficiency on file” flag has been utilized by design and used as a scapegoat to prevent Baha’i students from enrolling in college since 2006. Many of the disqualified applicants achieved high rankings on this year’s admission test, or have participated in the test for several consecutive years in hopes of one day passing muster and moving on to the application stage. While many Baha’i students find themselves held back from ever pursuing post-secondary studies, some are admitted into institutions of higher education only to be blackballed later. 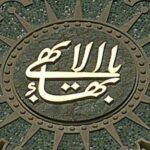 In the past two weeks, at least four Baha’i students have been expelled from their universities, denied the right to obtain degrees they have earned, or prohibited from furthering their studies: Anahita Horr and Shaghayegh Zabihi Amrie, associate’s students of architectural drafting at Rasam non-profit University in Karaj on the western outskirts of Tehran; Nikan Shaydan Shidi, third-semester student of industrial mold-making at Tehran Technical University; and Misagh Aghsani, student at Payame Noor University in the northwestern city of Urmia. At least 10 Baha’i citizens were recently arrested by security forces in the cities of Shiraz and Karaj. 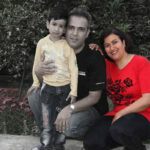 HRANA reported on the arrest of six Baha’i residents of Shiraz on September 15th and 16th: Sudabeh Haghighat, Noora Pourmoradian, Elaheh Samizadeh, Ehsan Mahbub-Rahvafa, and married couple Navid Bazmandegan and Bahareh Ghaderi. Meanwhile, Peyman Maanavi, Maryam Ghaffaramanesh, Jamileh Pakrou, and Kianoush Salmanzadeh were detained in the city of Karaj. Since the 1979 Islamic Revolution, arrests, detentions, and sometimes prolonged imprisonment on various pretexts have been among the most common methods of persecuting Baha’is. In recent days, pursuant to trials convened in absentia without informing the defendants or notifying their attorneys, Farhad Sarafzar, Shahram Mansour, Vahid Dana, Saeid Abedi and Adib Haghpajou were sentenced to terms of imprisonment and exile by Branch One of the Shiraz Revolutionary Court. An informed source told HRANA that the above five were charged with “propaganda against the regime.” In addition to one year in prison, each was doled a punishment of exile in a different remote detention center: Sarafraz was sentenced to one year of exile to Jahrom, Mansour to one year of exile in Eghlid, Dana to one year of exile in Arsanjan, Abedi to one year of exile in Darab, and Haghpajouh to one year of exile in Larestan. On August 5, 2014, HRANA reported the arrest of Haghpajouh, Abedi, and Dana. On September 1, 2014, it covered the arrest of Mansour and Sarafraz by Shiraz security forces. A booth entitled “Gooy Publication” dedicated to the sale of books aimed at inciting hatred against the Baha’i faith and its followers was on display at the recent Urmia book fair this year, one instance of an increase in Baha’i-focused literature at this year’s fairs–for better or for worse. This year’s hosting of the Tehran International Book Fair in May saw a significant increase in the number of anti-Baha’i publications, with such titles for sale as “The Perverse Bahaist Sect.” The Center for Undisclosed Documents of the Islamic Revolution presented a book promising to help the reader understand “various dimensions of the Baha’ist Sect,” while the Center for Baha’i Research, which had two booths in this Fair, has also dedicated almost all of its books to this topic. The publishers of anti-Baha’i books are financed principally by governmental or religious entities. The increase of such material at the Tehran International Book Fair coincides with an increased blowback against Baha’is even passively expressing their religious belief, e.g. on their university enrollment forms. Baha’is are forbidden from developing a congregation or observing their rites, as evidenced by dozens of Baha’i citizens currently serving prison terms for practicing their faith or seeking to implement administrative structure to their faith community. While no new business closures have been reported in the past two weeks, previously shuttered shops have yet to be brought back into commission, keeping their Baha’i owners out of work and placing significant financial burdens on their families. HRANA previously reported on security agents and local Offices of Public Places sealing Baha’i-owned business across several Iranian cities. In observance of their beliefs, Baha’i shop owners close their places of business on particular days of the year in order attend religious services. According to paragraph B of Article 28 of guild system law, owners can close their shops up to 15 days per year without informing authorities. Now, despite legal and civil protections against it, security forces have forcibly closed many of these businesses indefinitely. United Nations special rapporteurs on the situation of human rights in Iran have repeatedly protested the anti-Baha’i initiatives of the Iranian regime. In their mistreatment of Baha’is, Iranian authorities blatantly flout their public commitments to the human rights community at large. 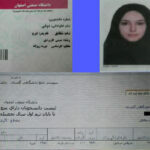 Human Rights Activists News Agency (HRANA) – A large number of Baha’i students who participated in the 2018 National University Entrance Exam, known as “Konkur,” have had their applications flagged “deficiency on file” on the National Organization for Educational Testing website, a known harbinger of educational aspirations dead in the water. 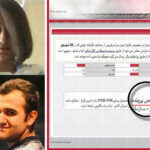 The barred Baha’i students are Shamim Idelkhani, of Ardebil, ranked #139; Farnia Iliyazadeh of Tehran, studying Mathematics; Parmida Husaynpuli Mamaqani, ranked #4500, studying Mathematics; Sarvin Azarshab of Tehran, studying business, ranked #19000; Parand Mithaqi; Shahrzad Tirgar; and Melina Qavaminik, from Tehran, studying mathematics, ranked #10545. Yesterday, HRANA reported on a number of Baha’is at the same impasse: Tarannum Mu’tamedi Broujerdi from Shahin Shahr of Isfahan, Faran Abbaspouli Mamaghani from Tehran, Sahand Ghaemi from Shahin Shahr of Isfahan, Vahid Sadeghi Sisan, and Shaghayegh Ghassemi.